Jste 21170. návštivník této stránky. 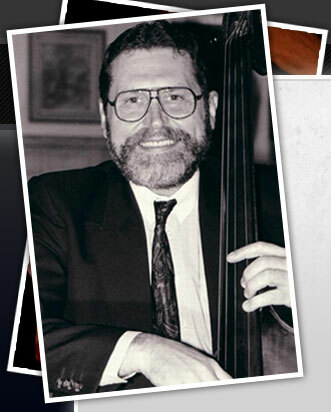 Vinzenz Kummer - born in Brno, Czech Republic, where he graduated as a double bass player in the Leos Janacek Conservatory in 1965. Already as a student Vinzenz Kummer played with various local jazz bands: Jazz combo of the Gustav Brom orchestra, Jazz trio of Leon Slezak featuring the most popular Czech guitar player Antonin Julina, also with Mirko Foret, Jiri Danes, Jozka Karen and Erik Knirsch orchestras. He boasts a three-year stint with the Czech Radio Orchestra and the Brno Philharmonic Orchestra. After a mandatory army service in Prague, where he played for the Army band, he quickly established himself on the local jazz-scene. He started collaborations with several important combos, bands and musicians including Jazz Celulla of Laco Deczi, SHQ of Karel Velebny, Jan Hammer Jr. Trio, Jiri Stivin, Eva Olmerova, Vlasta Pruchova, Karel Ruzicka, Laco Tropp, Emil Viklicky, Lada Zizka, Rudolf Dasek, Ludek Svabensky. Later on he was engaged in the Semafor theatre, also with the Nonet and Big band of Vaclav Kozel and many others. At the same time he was playing with the Karel Vlach, Ferdinand Havlik, Vaclav Hybs orchestras. Last but not least he worked with the Prague Radio Big band lead by Josef Vobruba and Kamil Hala. Thereafter Vinzenz Kummer worked with Ladislav Stajdl orchestra for 10 years. This band accompanied the most popular Czech singer Karel Gott. He also played with the Big Orchestra of Pragokoncert lead by Milivoj Uzelac, which used to accompany major Czech pop stars. As a member of all mentioned orchestras he recorded many LP´s and CD`s and a vast number of television shows. In the year 1981 Vinzenz Kummer left his native country to pursue a new life in the exile in Switzerland, where he took a chance to work with major stars of European and American jazz scene. Among others he worked with Tony Scott, Slide Hampton, Dee Dee Bridgewater, Maynard Ferguson, Mel Lewis, Alex Wellsh, Oskar Klein, Tony Lakatos, Kirk Lightsey, Kim Parker (daughter of Charlie Parker), Eddie “Lockjaw” Davis, Harry”Sweets” Edison, Johnny Griffin, Red Holloway, Sir Roland Hanna, Al Grey, Dexter Gordon, Maxine Weldon, Joan Faulkner, Harold Ashby, Dusko Goykowich, Gianni Basso, Walter Davis Jr., Dizzy Gillespie, Chet Baker, John Lewis, Ed Thighpen, Bobby Durham, Deborah Brown, Jimmie Smith, Gus Johnson, Scott Hamilton, Danny Moss, Benny Bailey, Ralph Sutton, Cedar Walton, Peter Appleyard, Alvin Queen, Ronnie Burrage, Eddie Thompson, Clark Terry, Kenny Drew, John Engels, Jake Hanna, Tete Montoliu, Shorty Rogers, Bud Shank, Charlie Rouse, Teddy Edwards, Sal Nestico, Nat Adderley, Buddy DeFranco, Terry Gibbs, Clyde”Batom” Lucas, Dado Moroni and many others. After 25 years of successful musical and educational work in Zurich Vinzenz Kummer returned home to his native city of Brno. Since then he has kept himself busy with composing, arranging and also cooperating with local jazz-scene as a bass player. The younger generation is represented by Vilem Spilka, Radek Zapadlo, Radim Hanousek, Kamil Slezak, Vlastimil Smida, Tomas Vesely, Monika Bagarova, Jozka Bagar and Lazaro Cruz. He has also been enjoying company of many old friends of his, such as Jan Beranek, Milan Kasuba, Miroslav Hanak, Günter Koci, Gabinka Koci, Jirka Suchy, Ladislav Kana, Jarda Zvonik, Vit Vavrda and many others.